Pestilence in Wales known as Y Fad Velen, or Yellow Fever. Plague similar to the Continental Plague of the previous century - the disease first came to Ireland destroying two thirds of the population and then moved to mainland Britain depopulating southern parts of England before moving on to Northumbria. Many famine-related plagues during these centuries which became known as "famine sickness" For example - In the year AD 762, Wales suffered from a pestilence which subsequently spread all over England and continued until AD 771. First entered Britain in early August 1348 via the port of Weymouth, Dorset and reached London by December the same year where it lasted for six to seven months. By March 1349 it had reached the Eastern Counties and by August it had spread north to York and across t Ireland and than appears to have reached Wales & Scotland by either 1349 or 1350. Friar Clyn of Kilkenny's description of the plague is important for including one remarkable symptom on which great importance has been laid as distinctive of the Black Death among the epidemics of bubo-plague, namely haemorrhage from the lungs: “For many died from carbuncles, and boils, and botches which grew on the legs and under the arms; others from passion of the head, as if thrown into a frenzy; others by vomiting blood.” It was so contagious, he says, that those who touched the dead, or even the sick, were incontinently infected that they died, and both penitent and confessor were borne together to the same grave. Such was the fear and horror of it that men scarce dared exercise the offices of pity, namely, to visit the sick and bury the dead. Clyn’s list of symptoms includes all the most prominent features of the plague - the botches in the armpits or groins, the carbuncles, the boils (or blains), and the frenzy or delirium, as well as the special symptom of the great mortality—vomiting of blood. The Great Mortality came to an end everywhere in England by Michaelmas, 1349. An epidemic of "pestilence" which due to prolonged periods of heat and drought may have been primarily a "famine-sickness". Epidemic of true bubo-plague countrywide. Plague in Northern England and London. A "pestilence" of people, murrain of cattle, failure of crops, great floods, etc. Plague, probably a mixture of famine-pestilence with bubo-plague which was so prolonged and so serious as to be compared with the Great Mortality itself. In 1389, the king was in the south of England, and seeing some of his men prostrated by sudden death, he returned to Windsor. Another outbreak came the year after. Intense heat began in June and lasted until September; great mortality ensued, the epidemic continuing in diverse parts of England, but not everywhere, until Michaelmas; it cut off more young than old, as well as several famous soldiers. The St Albans entry confirms this: “A great plague, especially of youths and children, who died everywhere in towns and villages, in incredible and excessive numbers” After the epidemic there was scarcity, of which we have special accounts from Norfolk. But the heaviest mortality fell in the year 1391. There was first of all a food famine, now in its second year, and aggravated by six weeks of continual gloom in July and August. At the time of the nuts, apples and other fruits of the kind, many poor people died of dysentery, and the sickness would have been worse but for the laudable care of the mayor of London who caused corn to be brought from over sea. At York “eleven thousand” were said to have been buried. Another account says that the North suffered severely, and also the West, and that the sickness lasted all summer. Under the year 1393 many died in Essex in September and October, “on the pestilence setting in.” The next evidence comes from the Rolls of Parliament; in the first parliament of Henry IV. (1399) a petition is presented “that the king would graciously consider the great pestilence which is in the northern parts,” and send sufficient men to defend the Scots marches. 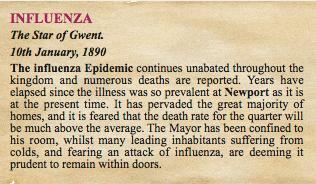 Influenza epidemic all over England. Plague in London, Newcastle, Hull and Southwell. Plague all over Britain - during 1500-1501 there were 20,000 deaths from plague in London alone (one third of the population). "French pox" as it was called in England (also the great pox and simply the pox), or the Spanish pox, as it was called in France, or the sickness of Naples, or the grandgore). Plague, various outbreaks all over the country. Earliest known mention of Smallpox in England. Outbreaks of Gaol Fever in Cambridge, Oxford. 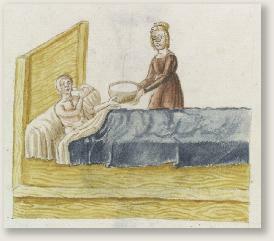 Further outbreaks of Sweating Sickness. Outbreaks of Dysentery, typhus and Influenza all over the country. The Great Plague of London. From the 1st January to end of December, 17,404 people died of the plague. A proclamation during the London plague of 1563 was directed against cats as well as dogs, “for the avoidance of the plague:” officers were appointed to kill and bury all such as they found at large. Curates and church-wardens were directed to warn the inmates of houses where plague had occurred not to come to church for a certain space thereafter. The blue crosses were to be affixed to infected houses. Also it was ordered by the Mayor and Council that the “filthie dunghill lying in the highway near unto Fynnesburye Courte be removed and carried away; and not to suffer any such donge or fylthe from hensforthe there to be leyde.” On the 9th of July, 1563, plague having been already at work for several weeks, a commission was issued by the queen in Council, that every householder in London should, at seven in the evening, lay out wood and make bonfires in the streets and lanes, to the intent that they should thereby consume the corrupt airs, the fires to be made on three days of the week. On 30th September, 1563, it was ordered that all such houses as were infected should have their doors and windows shut up, and the inmates not to stir out nor suffer any to come to them for forty days. At the same time, a collection was ordered to be made in the churches for the relief of the poor afflicted with the plague, and thus shut up. Another order was that new mould should be laid on the graves of such as die of the plague. Still another, the first of a long series, was to prohibit all interludes and plays during the infection. On the 2nd December, when the deaths had fallen to 178 in the week, an order was issued by the Common Council that houses in which the plague had been were not to be let. On the 20th January, 1564, there was an order for a general airing and cleansing of houses, bedding and the like. By that time the deaths had fallen to 13 in the week. The most rigorous measures in this plague were those which Queen Elizabeth took for her own safety at Windsor in September 1563 - “a gallows was set up in the market-place of Windsor to hang all such as should come there from London. No wares to be brought to, or through, or by Windsor; nor any one on the river by Windsor to carry wood or other stuff to or from London, upon pain of hanging without any judgment; and such people as received any wares out of London into Windsor were turned out of their houses, and their houses shut up”. 23 year Plague period in various parts of the country. The London Plague - 10,662 deaths from the disease in 1593, 421 in 1594; and 29 in 1595. Plague in the north of England. Smallpox outbreaks all over the country. Severe outbreaks of Smallpox & Plague. Fevers, Agues, Measles and Smallpox in London. Last period of Plague in England. 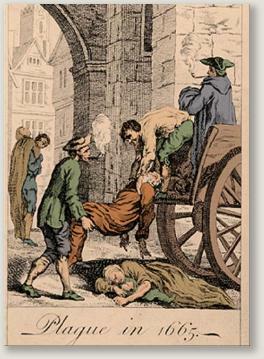 Deaths from plague in London in the years 1603, 1606 to 1611, 1625, 1636 to38 and 1665 were the greatest in the whole history of the City's epidemics - Population 250,000 there were 30,519 plague deaths in 1603; Population 320,000 - 35,417 deaths in 1625. “Spotted fever" (not plague). A new disease in England & Wales. In a Hampshire parish "it was raging so fiercely about harvest that there appeared scarce hands enough to take in the corn; which argues, considering there were 2700 parishioners, that 7 might be sick for one that died; whereas of the plague more die than recover. They lay longer sick than is usual in plague,” and there were no plague-tokens. In the very same season (autumn and winter of 1638) we hear of what is obviously the same sickness being epidemic all over the county of Monmouth. 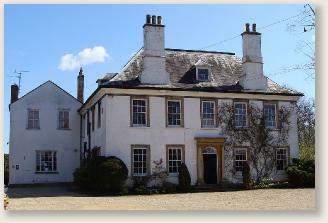 On April 23, 1639, the sheriff of Monmouthshire thus explained his delay in executing the king’s writ for an assessment: “In January last I sent forth my warrants for the gathering and levying thereof, but there has been such a general sickness over all this country, called ‘the new disease,’ that they could not possibly be expedited.... Besides, the plague was very hot in divers parts of the county, as Caerleon, Abergavenny, Bedwelty, and many other places. "War-typhus" in Oxford, Reading &Tiverton. Plague in the provinces. Typhus fever epidemics in London. Another Great London Plague. Out of a population of 460,000 there were 68,596 (one sixth of London's inhabitants, or 80,000 people - according to Wikipedia) deaths from plague in this year. It is sometimes suggested, as plague epidemics did not recur in London after the fire, that the fire saved lives in the long run by burning down so much unsanitary housing with their rats and their fleas which transmitted the plague. Historians disagree as to whether the fire played a part in preventing subsequent major outbreaks. The Museum of London website claims that there was a connection, while historian Roy Porter points out that the fire left the most insalubrious parts of London, the slum suburbs, untouched. Smallpox epidemics in London. 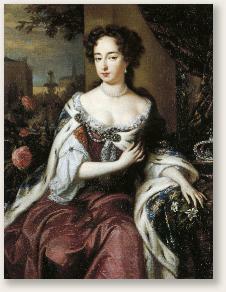 In 1694 Queen Mary II [wife of WilliamIII] died from the disease. Dysentery - known by contemporaries as The Bloody Flux, was a disease spread by infected food and water, and also by flies. This was a summer disease, more virulent in warm and humid weather, and was especially common in coastal towns and especially ports, introduced by visiting ships whose crew carried the infection. There was a documented outbreak of the disease in Cardiff in 1697. Smallpox epidemic. Began in London and during the next 2 years spread extensively. Diptheria was now identified by Fothergill and described a "sore throat accompanied by ulcers"
Smallpox - the most extensive and fatal outbreak in England up to that date. Began in London and rapidly spread to all parts of the country. 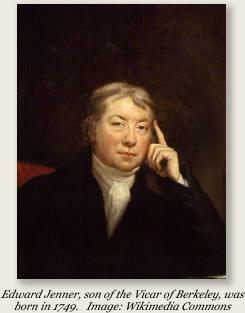 The first Smallpox vaccination was performed by Edward Jenner. Smallpox. Two major British epidemics. Cholera spread from the Continent. Outbreaks in 431 towns and villages around Britain. Smallpox - 42,000 deaths in Britain led to a Vaccination Act providing free vaccination as a charge on the parish poor rates. 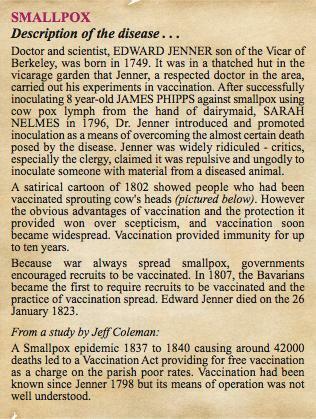 Vaccination had been known since Jenner in 1798 but its means of operation was not well understood. Typhus outbreaks all over Britain especially the North of England and Scotland. Cholera - a widespread epidemic - 52,000 deaths. The disease attacked 803 towns and villages. Diptheria - extensive epidemic - many deaths all over the country. (was also known as Croup. Scarletina was often confused with Diphtheria). Typhus epidemic in London - 10,000 deaths. Smallpox was most often a disease of childhood. Surviving it was almost a rite of passage for children, but recovery, though it gave immunity from further infection, often left the sufferer horribly scarred. Smallpox also came with great social stigma, leaving scarred survivors ostracised from their friends and families. It could run rampant through families and communities and, in the days before inoculation, there was little defence. So feared was it that advertisements for servants in 18th century households sometimes stipulated that applicants must already have had the disease, to prevent them bringing the infection into a family. Wales suffered less from the ravages of the plague than other parts of Britain. Bubonic plague was less virulent at the higher altitudes and colder environments found in Wales. Also, with large expanses of the Welsh countryside sparsely populated and fewer large towns in Wales, it made it more difficult for the disease to establish itself. The exception to this was the welsh coastline. With over a hundred miles of coast, and many large and small ports, there was ample opportunity for the introduction of disease and it was the port towns, and also towns along rivers and trading routes, which were the worst hit. The 1840 Public Health Act made variolation illegal and it provided optional vaccination, free of charge. In general, the disadvantages of variolation are the same as those of vaccination, but added to them is the generally agreement that variolation was always more dangerous than vaccination. In March of 1842 at Abergavenny, there were four cases of Workhouse babies dying after having been vaccinated for smallpox. 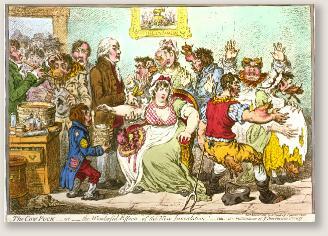 The introduction of inoculations for smallpox, cowpox and measles was adopted swiftly in many areas of Wales. Vaccination was first made compulsory with the 1853 Public Health Act, and the provisions were made more stringent in 1867, 1871, and 1874. But not everyone believed in vaccination: In Newport, some parents argued against the safety of the vaccinations, and were in fact prosecuted for refusing to present their children according to the requirements of the Vaccination Acts. On July 31, 1869, the Western Mail reported on a conference about vaccination held in Cardiff, at which a certain Dr Haviland reported his disgust at seeing children forcefully injected even in the waiting rooms of railway stations by over-zealous overseers. The case for the success of vaccination, he argued, was unproven. Was it DYSENTERY or CHOLERA? "The first Spasmodic Cholera Epidemic in York, 1832 Issues 37-46"; "The London Medical Gazette: Or, Journal of Medical Practical Medicine, Vol. 9, 1832 - Google eBooks"